1. Some Historical Perspective. 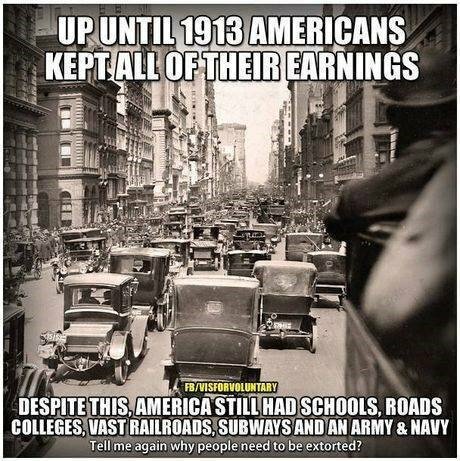 “In the beginning” when the US federal income tax was first introduced in 1913, it used to be a lot, lot simpler and a lot easier to file taxes; so easy in fact that it was basically like filling out your federal tax return on a postcard. 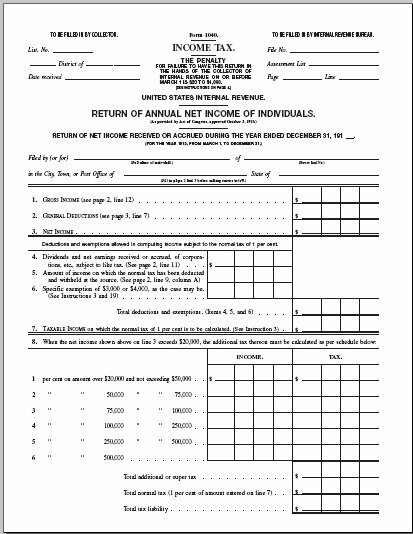 For example, page 1 of the original IRS 1040 income tax form from 1913 appears above. There were only four pages in the original 1040 form, including two pages of worksheets, the actual one-page 1040 form above, and only one page of instructions, view all four pages here. In contrast, just the current 1040 instructions for 2018, without any forms or schedules, runs 117 pages (forms and schedules are available separately here and here). 2. Tax Graphic of the Day (above). Some more historical perspective…. 3. Opportunity Cost. In a 2012 report to Congress (most recent data available), the National Taxpayer Advocate estimated that American taxpayers and businesses spend 6.1 billion hours every year complying with the income tax code, based on IRS estimates of how much time taxpayers (both individual and businesses) spend collecting data for, and filling out their tax forms. In addition, Americans will spend an estimated $10 billion for the services of tax preparation firms and $2 billion on tax-preparation software programs like TurboTax that still require many hours of time. The amount of time spent for income tax compliance – 6.1 billion hours – would be the equivalent of more than 3 million Americans working full-time, year-round (or 2% of total US payrolls of 150 million). By way of comparison, the federal government currently employs 2.8 million full-time workers, and Wal-Mart, the world’s largest private employer, currently employs 2.2 million workers worldwide and 1.3 million workers in the US (both full-time and part-time). At the current average hourly wage of $27.70 an hour, the dollar value of the opportunity cost associated with tax filing would be $169 billion, which exceeds the GDP of 19 US states. 4. Tax Progressivity. And just how progressive is the US federal income tax system? Very, very progressive, see the chart above showing average effective tax rates by various income groups based on Tax Foundation data here for 2016 (most recent year available). That pattern of income tax progressivity explains why almost all federal income taxes are paid by the top income groups (see next few items). 5. Tax Progressivity and Tax Burden. 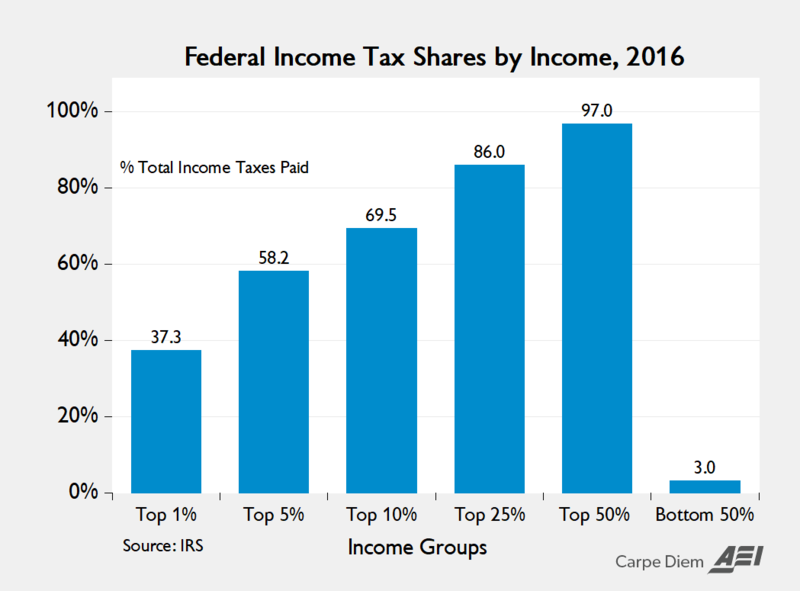 According to the most recent IRS data, the federal income tax shares by six different income groups in 2016 are displayed in the chart above. Almost all federal income taxes (97%) are paid by the top 50%, more than 2/3 of income taxes are paid for by the top 10% and more than 40% of taxes are paid by the top 1% of taxpayers. For all of the criticism and negative publicity the “Top 1%” get, I’d like to personally thank that group this year at tax time for shouldering such a disproportionate share of our collective tax burden – that group of Americans with income above $481,000 in 2016 generated 19.7% of the nation’s Adjusted Gross Income but that group’s share of federal income taxes at 37.3% was about twice that. It’s a form of “disparate impact” on the 1% that we all benefit from! So, I say “Thank You Top 1%” from all of us in the bottom 99% for your valuable and significant contribution to our nation’s tax burden. 6. Tax Burden of the Top 1% vs. the Bottom 95%. 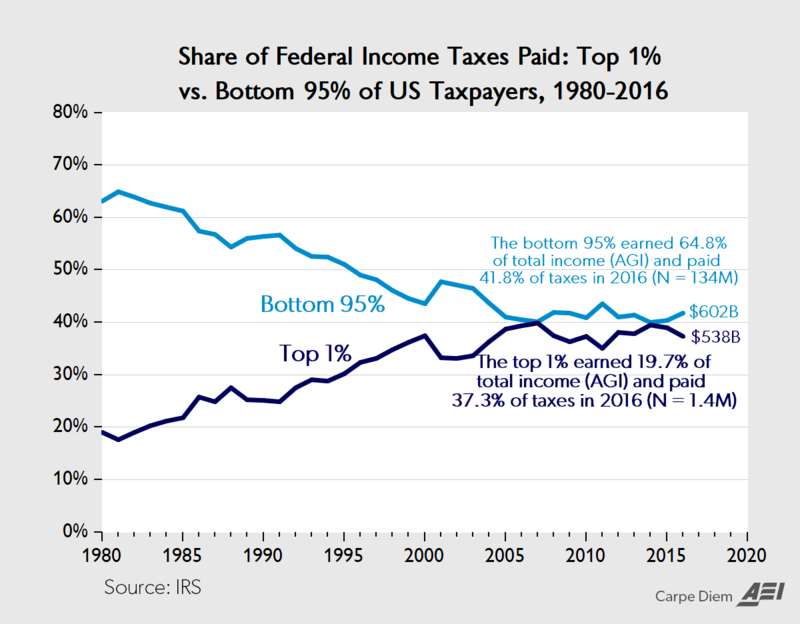 The chart above gives us another perspective on the tax burden of the top 1% of taxpayers over time and compares the tax share of that group to the tax burden of the bottom 95% in every year between 1980 and 2015 (most recent year available from the IRS). 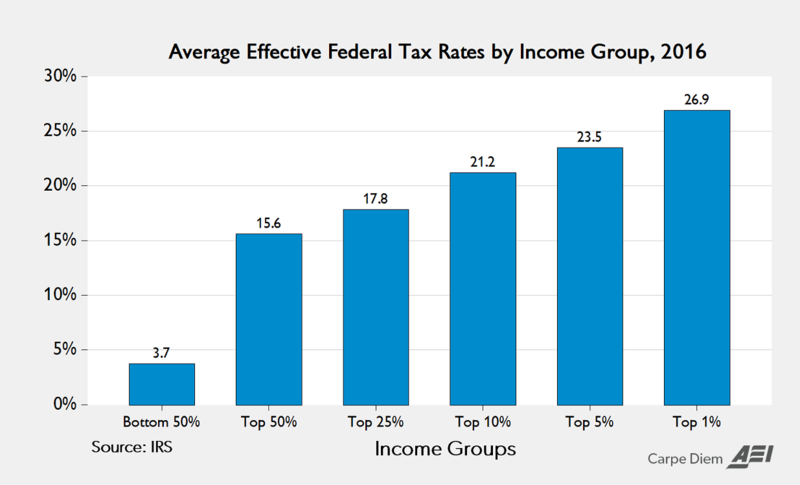 In 2016, the top 1% earned 19.7% of the total income reported to the IRS (as mentioned above) and paid more than 37% of all federal income taxes collected ($538 billion). The bottom 95% of US taxpayers earned 64.8% of total income (almost three times as much as the top 1%) and paid only 41.8% of the total income taxes collected ($602 billion). So once again, to the 1.4 million taxpayers in the top 1%, I say “Thank You” for paying almost as much in federal income taxes in 2016 as the nearly 134 million taxpayers in the bottom 95% by income. 7. Bowling vs. Taxes. Speaking of the progressivity of income taxes, here’s a thought about the way we tax income vs. the way we score bowling. Under the scoring rules of bowling, you get rewarded, not penalized, for being successful. If you get a spare, the scoring system rewards you by adding the pins from the next ball into the current frame, and if you get a strike you get rewarded by adding your next 2 balls into the current frame. Under our progressive income tax system with 7 tax rates in 2018 increasing from 10% to 37%, you get penalized, not rewarded, for being successful, productive and entrepreneurial, because the more you earn, the higher the tax rate you pay. The top marginal income tax rate has been as high as 91% in the 1950s and 1960s, and 70% in the 1970s. If we scored bowling the way we tax income, we would subtract, not add pins for a spare or strike, i.e., penalize successful bowling. If we taxed income the way we score bowling, we would have lower, not higher, tax rates on our most successful income-earners. 8. Coincidence? Why are Tax Day (April 15) and Voting Day (first Tuesday in November) so far apart? Couldn’t we move Tax Day to the first Monday in November or Voting Day to the first Tuesday following April 15? And maybe end tax withholding so that Americans would pay their federal income taxes as a lump sum right before voting? 9. What’s In a Name? Why do we call the IRS a “service?” Couldn’t it have been named a department like Labor, a bureau like the BLS or the FBI, a commission like the FTC, an administration like FDA, an agency like EPA, etc.? And have you ever noticed that “The IRS” spells “Theirs”? Hmmmmmmm….. Recent debates over the equity of the income tax system have centered chiefly on whether high-income Americans are paying their “fair share” in taxes. There has been less discussion about the growing number of Americans who pay no federal income tax—the so-called nonpayers. Today, the percentage of tax filers who pay no income taxes due to the generous credits and deductions in the tax code has reached levels not seen since the income tax became a “mass tax” in 1940. 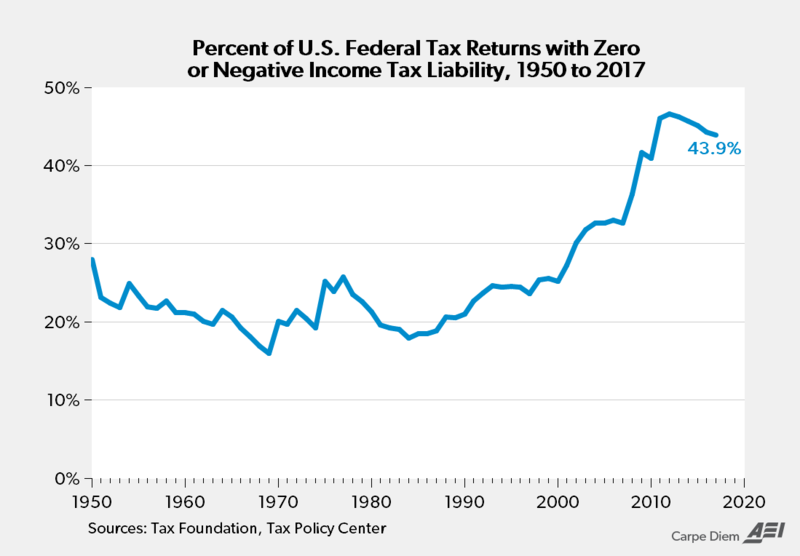 This trend raises serious concerns about the equity of the U.S. tax system, the fiscal stability of the federal government, and the political implications of disconnecting millions of citizens from the primary means of funding government programs. As the chart shows (based partly on Tax Policy Center data here), the number of “nonpayers” of federal income tax last year as a share of all taxpayers was nearly 44%, or more than double the roughly 20% of “nonpayers” between 1950 and 1990. When it comes to the issue of “fairness” about paying federal income taxes, we only ever hear about how “the rich” don’t pay their “fair share” but never about the rising percentage of Americans who are “nonpayers” — whose percentage as a share of all taxpayers has more doubled over the last 25 years.